If these redbrick walls could talk, a chorus of voices from 100 years of community use would echo all that was good about Sonoma: the love of food and wine, the search for cultural enrichment, and the need to care for people. Since the day it opened as the Sonoma Grammar School, the center has promoted education, the arts, and a respect for history. Thousands of elementary-age students walked its halls until 1948, when building codes closed it as a public school. 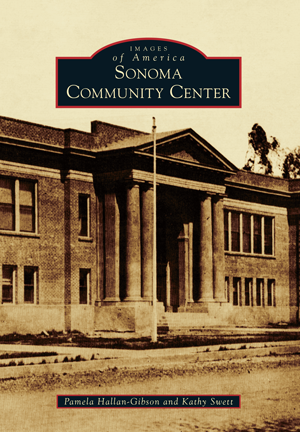 But it was reborn in 1952 as the Sonoma Community Center due to generous donors who formed a nonprofit organization to save the building they considered the heart and soul of Sonoma. Since then, thousands of others have used its classrooms, lecture halls, and auditorium to be entertained, to celebrate events, to develop creative interests, and to cultivate their sense of community. Through vintage pictures, Pamela Hallan-Gibson, author of Orange County: The Golden Promise and Two Hundred Years in San Juan Capistrano, and Kathy Swett, the former executive director of the Sonoma Community Center for 12 years, have chronicled the building's remarkable role in the history of one of California's oldest towns.